Patients at risk for group A Streptococcus (GAS) pharyngitis are those aged > 3 years who present with sore throat and a history of fever, headache, nausea, vomiting, abdominal pain, tonsillopha­ryngeal inflammation, patchy tonsillopharyngeal exudates, palatal petechiae, and anterior cervical adenitis. The presence of cough, coryza, diarrhea, hoarse­ness, rhinorrhea, discrete ulcerative lesions in the mouth, or symptoms lasting > 5 days argues against the need for diagnostic testing for GAS. The Centor Score estimates the probability that pharyngitis is streptococcal and suggests the management course. The Centor Score correlates directly with the risk of a throat culture that is positive for group A Streptococcus (GAS). The most recently updated guideline from the Infectious Diseases Society of America for diagnosis and management of GAS pharyngitis no longer recommends empiric treatment. The new recommendation is to test patients who are at higher risk for GAS pharyngitis, but give antibiotics only when a patient’s rapid antigen detection test or throat culture is positive for GAS (Shulman et al 2012). The modified criteria designated by McIsaac et al (2004) include an age component, along with tonsillar swelling. GAS is incredibly rare in patients aged < 3 years, and is also less common in older adults, so the age component can help clinicians risk stratify patients. Most cases of pharyngitis are viral in origin. Given the rare incidence of acute rheumatic fever, along with the questionable benefits of early antibiotics to prevent sequelae like peritonsillar abscess, antibiotics are now prescribed much less often. Steroids (such as dexamethasone) and NSAIDs (nonsteroidal anti-inflammatory drugs) often provide similar pain relief and resolution of symptoms to antibiotics. Most pharyngitis is viral and does not respond to antibiotic treatment. The Centor Score attempts to predict which patients will have culture-confirmed GAS infections of the pharynx, to help determine which patients to test in the first place. The newer FeverPAIN Score is similar, but the Centor Score has the advantage of distinguishing adolescents and young adults from preadolescents, which is important because streptococcal carrier rates for preadolescents are higher than for adolescents and young adults, and older patients exhibit more severe symptoms and develop suppurative complications more frequently (Mitchell et all 2011). For use in children with pharyngitis, primarily; the risk of GAS decreases significantly with age into adulthood. Use only in patients with recent onset (≤ 3 days) of acute pharyngitis. Steroids and NSAIDs improve symptoms; antibiotics are often indicated in GAS pharyngitis, but do not prevent its suppurative complications, such as peritonsillar abscess. It is still important to carefully consider patients with symptom duration longer than 3 days, even though the Centor Score does not apply. While symptoms are not compatible with a diagnosis of acute pharyngitis, these patients require evaluation for suppurative complications (eg, peritonsillar abscess or Lemierre syndrome), or viral infections in adult patients (eg, infectious mononucleosis or acute HIV) (Centor 2017). The goal of the original study by Centor et al was to develop criteria to diagnose GAS infection in adult patients presenting to the emergency department with a sore throat (Centor et al 1981). The original model designated 4 criteria: tonsillar exudates; swollen, tender anterior cervical nodes; absence of cough; and history of fever. Patients exhibiting all 4 variables had a 56% probability of having a group A beta strep-positive culture; the probability was 32% in patients with 3 variables, 15% in patients with 2 variables, 6.5% in patients with 1 variable, and 2.5% in patients with none of the variables. The Centor Score was later modified to include age (McIsaac et al 1998) and was validated (McIsaac et al 2004) for use in both children and adults presenting with a sore throat. McIsaac et al (1998) determined that using the Centor Score would reduce the number of unnecessary initial antibiotic prescriptions by 48%, without increasing throat culture use. The Centor Score and its modifications were derived in relatively small samples (n = 286 and n = 521, respectively). In order to more precisely classify the risk of GAS infection, Fine et al (2012) performed a national-scale validation of the score on a geographically diverse population of > 140,000 patients presenting in a clinical setting. The study was carried out over the course of more than a year, mitigating any impact of seasonality of GAS incidence on the results. This analysis provided more precise interpretations of risk for each category of the Centor Score and still fell within the 95% confidence interval of the original study by Centor et al (1981), which had a much smaller sample size. In their comparison of the Centor Score with other identification and treatment strategies, McIsaac et al (2004) found that use of the score resulted in fewer overall tests (throat cultures and rapid antigen detection tests) per person, but more throat cultures (96.1% of adults) than other strategies. As a result, the Centor Score represented a compromise, requiring the least diagnostic testing, providing 100% sensitivity and greater than 90% specificity in both children and adults, and producing significant reductions in unnecessary use of antibiotics, compared with other strategies. Harris et al (2016) encouraged the use of the Centor Score primarily to identify patients with a low probability of GAS pharyngitis who do not warrant further testing, citing the low positive predictive value of the criteria. Read more about Dr. Centor. Centor RM, Witherspoon JM, Dalton HP, et al. The diagnosis of strep throat in adults in the emergency room. Med Decis Making. 1981;1(3):239-246. McIsaac WJ, White D, Tannenbaum D, et al. A clinical score to reduce unnecessary antibiotic use in patients with sore throat. CMAJ. 1998;158(1):75-83. Fine AM, Nizet V, Mandl KD. Large-scale validation of the Centor and McIsaac scores to predict group A streptococcal pharyngitis. Arch Intern Med. 2012;172(11):847-852. McIsaac WJ, Kellner JD, Aufricht P, et al. Empirical validation of guidelines for the management of pharyngitis in children and adults. JAMA. 2004;291(13):1587-1595. Shulman ST, Bisno AL, Clegg HW, et al. Executive summary: clinical practice guideline for the diagnosis and management of group A streptococcal pharyngitis: 2012 update by the Infectious Diseases Society of America. Clin Infect Dis. 2012;55(10):1279-1282. Harris AM, Hicks LA, Qaseem A, et al. Appropriate antibiotic use for acute respiratory tract infection in adults: advice for high-value care from the American College of Physicians and the Centers for Disease Control and Prevention. Ann Intern Med. 2016;164(6):425-434. Mitchell MS, Sorrentino A, Centor RM. Adolescent pharyngitis: a review of bacterial causes. Clin Pediatr (Phila). 2011;50(12):1091-1095. Centor R. Centor's corner: FeverPAIN versus Centor Score. Paging MDCalc [blog]. Available at: http://paging.mdcalc.com/2017/08/18/centors-corner-feverpain-versus-centorscore/. Accessed November 16, 2017. 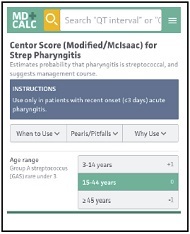 Access the FeverPAIN Score for Strep Pharyngitis. Identify the patient population at risk for group A Streptococcus (GAS) pharyngitis complications. Describe the current antibiotic treatment recommendations for GAS pharyngitis. Discuss options for adjunctive therapy for GAS pharyngitis. Recognize complications of GAS pharyngitis and their management. Date of Original Release: December 1, 2017. Date of most recent review: November 15, 2017. Termination date: December 1, 2020. Other Specialty CME: Included as part of the 4 credits, this CME activity is eligible for 4 Infectious Disease CME and 0.5 Pharmacology CME credits, subject to your state and institutional requirements. Faculty Disclosure: It is the policy of EB Medicine to ensure objectivity, balance, independence, transparency, and scientific rigor in all CME-sponsored educational activities. All faculty participating in the planning or implementation of a sponsored activity are expected to disclose to the audience any relevant financial relationships and to assist in resolving any conflict of interest that may arise from the relationship. Presenters must also make a meaningful disclosure to the audience of their discussions of unlabeled or unapproved drugs or devices. In compliance with all ACCME Essentials, Standards, and Guidelines, all faculty for this CME activity were asked to complete a full disclosure statement. The information received is as follows: Dr. Vazquez, Dr. Sanders, Dr. Avner, Dr. Cantor, Dr. Claudius, Dr. Mishler, and their related parties report no significant financial interest or other relationship with the manufacturer(s) of any commercial product(s) discussed in this educational presentation. Dr. Jagoda made the following disclosures: Consultant, Daiichi Sankyo Inc; Consultant, Pfizer Inc; Consultant, Banyan Biomarkers Inc; Consulting fees, EB Medicine.